We all immediately notice the aesthetic effects of missing teeth, but did you know missing teeth can also have a negative impact on your dental health. Replacing a missing tooth can restore beauty and function to your smile. A single tooth dental implant can effectively restore a lost tooth. Implants are the only tooth replacement option that replaces the tooth root and the visible portion of the tooth. Dr. Joseph Cavallo is an experienced restorative dentist in Woodbridge, VA, offering patients advanced implant dentistry. As a trained implant dentist, Dr. Cavallo offers full-service dental implants under one roof. You don’t have to visit multiple offices for the care you need. Our team can handle all aspects of your care in our state of the art dental facility. When you lose a tooth, not only does it affect the approach of your smile but it can also affect your overall dental health. When a tooth is lost, the bone underneath the tooth begins to weaken. As a result of bone deterioration, patients can experience facial sagging, increased risk of gum disease, and additional tooth loss. Certain tooth replacement can address some of these concern but not all of them. Implants are designed to replace the entire missing tooth. A dental implant is a small titanium post that is surgically placed in the jaw bone. Once the implant heals, an abutment is placed on top of the implant post. The abutment is considered “the connector” between the post and the restoration. For patients missing one tooth, we will place a dental crown as your final restoration. Dr. Cavallo will examine your teeth, review your medical history, and discuss your treatment options before determining if dental implants are right for you. In most cases, patients will need to be in excellent health and have an adequate amount of healthy bone structure to receive dental implants. 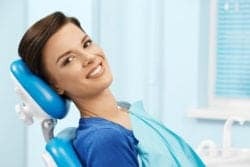 Advancements in implant dentistry have allowed patients who are not ideal dental implant candidates to receive the implant procedure and achieve great results. Our team will create a treatment plan that is designed to restore your lost teeth and get you one step closer to a healthier smile. If you are searching for a dentist who offers full-service dental implants in Woodbridge, Virginia, visit Dr. Cavallo. To schedule an appointment, call (703) 493-1203 or request an appointment online.